Unveiled in 2009, this shirt harkens back to an earlier time, a simpler time. A time when a phone call to Brooklyn would score you a listen to a potentially new song and giant, pixelated alien invaders from space rained down in a predictably horizontal fashion. 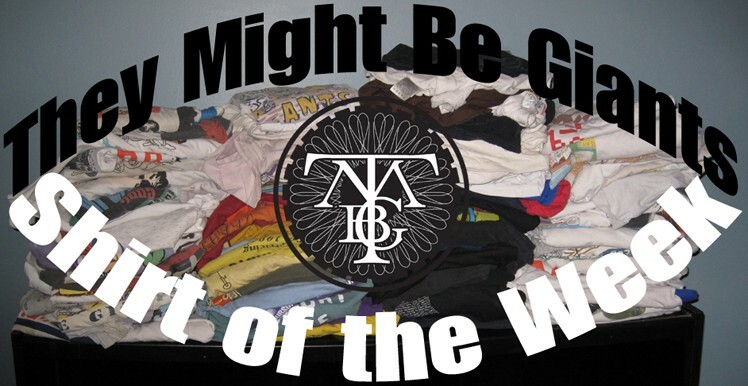 TMBG celebrates those bygone days with this nostalgic garment. 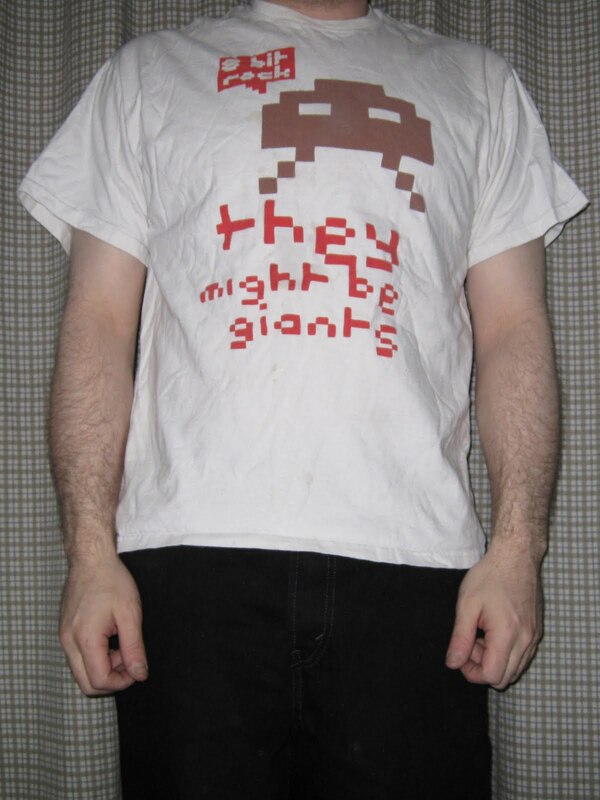 Purchase "8 Bit on White" now and go retro at the TMBG Merch Store! This design is available on a tote bag (colors reversed) and has also been sighted as a bumper sticker that has been given away at shows. John Flansburgh busted this one out during the Spy improv bit at the Mercury Lounge in New York City on 12/18/97. Here is one of the many shirts that feature Dial-a-Song, though more prominently then others with the phone number dealt out vertically in large digits from top to bottom, and the dashes represented by the four playing card suits. 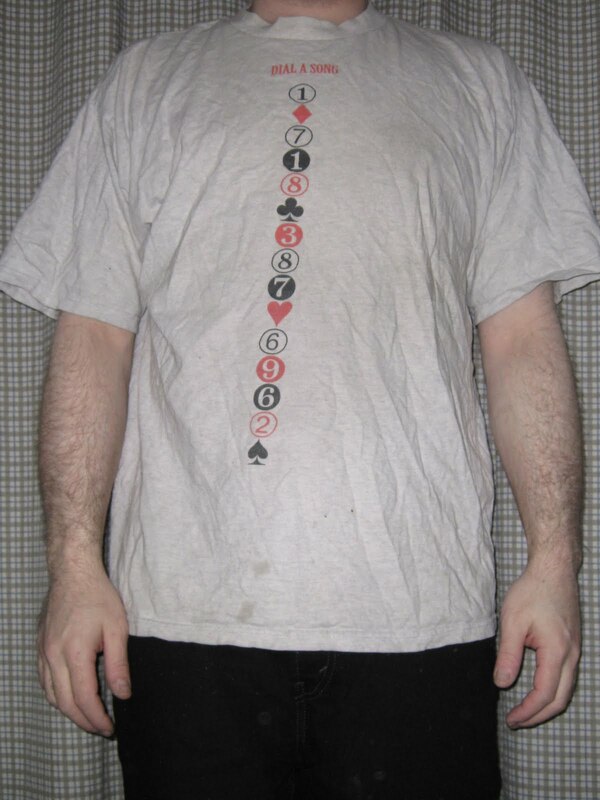 It's a light grey shirt. One large diamond is repeated on the back, above which is TMBG's official title, Brooklyn's Ambassadors of Love. Remember, Dial-a-Song itself may be gone but it's far from forgotten. 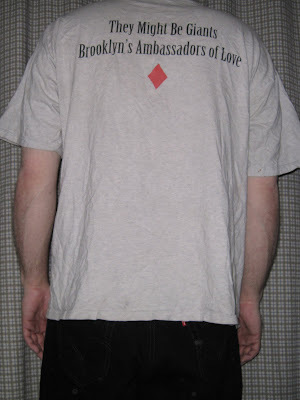 All hail the Ambassadors! Featuring John Linnell on clarinet, performed at The Bowery Ballroom in New York City on 10/23/99. Strictly speaking, this is not a They Might Be Giants shirt. 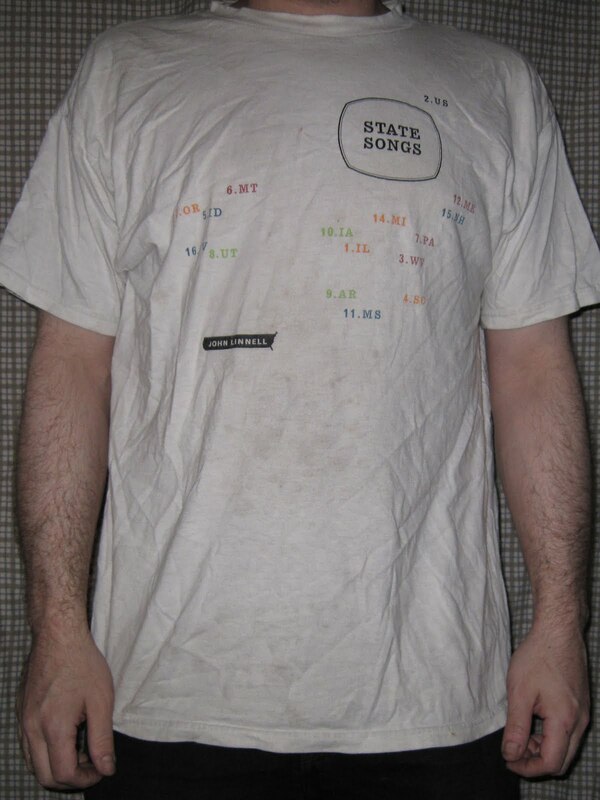 However, In honor of John Linnell's 52nd birthday tomorrow, I present to you the tee that represents his solo album, State Songs. It's really quite patriotic! On the front, the track numbers accompany their respective state abbreviations in a rough formation of the United States of America, duplicating what appears on the cd itself. 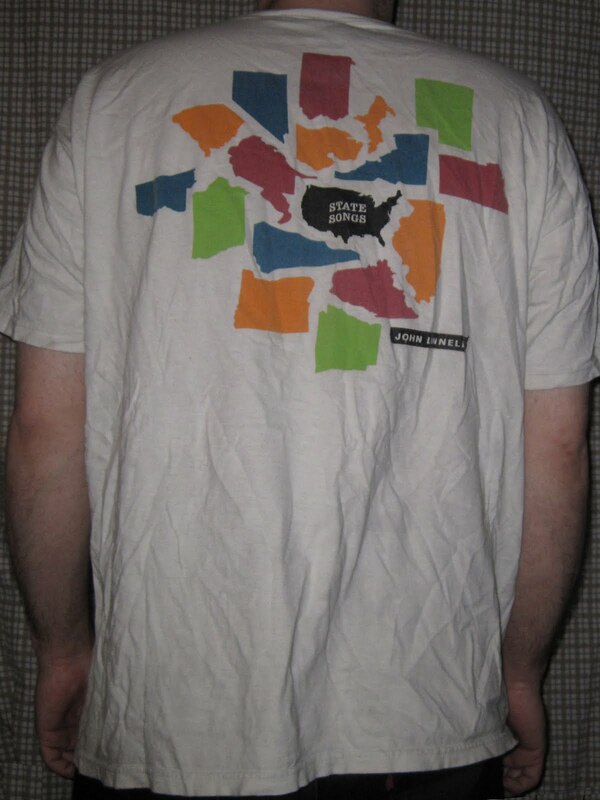 On the back, the same states are denoted by their outlines in a multitude of colors. Happy Birthday, John! Continuing with the Linnellian theme, here's a live performance of his state summation song from The Bowery Ballroom in New York City on 12/11/99. Four years ago this week I had the distinct pleasure of attending a special TMBG performance for Robosonic Eclectic, an extraordinary show in downtown Manhattan produced by the League of Electronic Musical Urban Robots (or LEMUR for short), a Brooklyn-based non-profit corporation founded in 2000 by musician and engineer Eric Singer that is dedicated to building musical robots that play themselves. It is truly fascinating stuff. 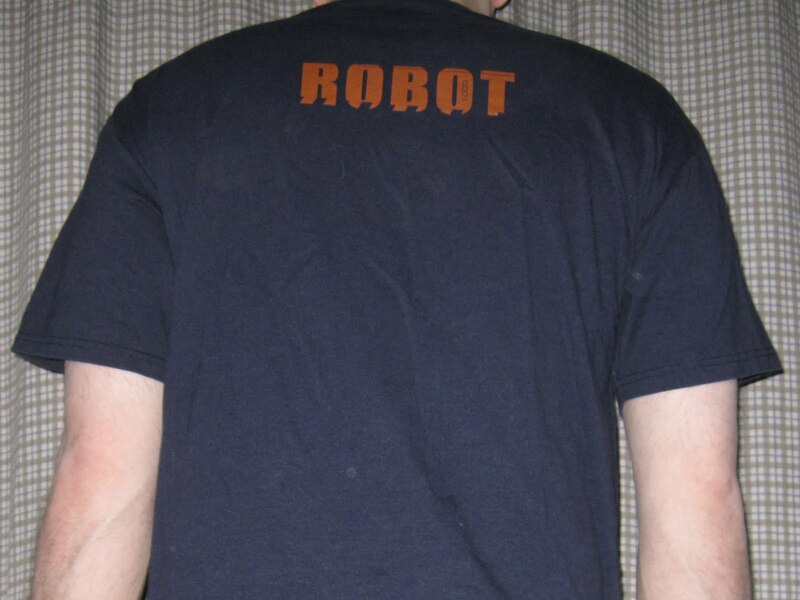 It should be noted that the shirt is not accurate in terms of what these musical 'bots look like. They're not at all humanoid like C3PO of Star Wars fame, Forbidden Planet's Robby the Robot and Honda's non-fictional ASIMO. To be clear, they're not robots that play instruments but robots that are instruments. There are two versions of this shirt, and I was having a hard time deciding if I was more ROBOT or HUMAN. I was able to silence the internal debate as well as double my "donation" to this worthy non-profit corporation by resolving to purchase both of them. I suppose that makes me something in between, perhaps some kind of thirsty cyborg with a taste for human flesh. The robotic instruments that accompanied TMBG included a GuitarBot (to the right), a XyloBot (to the left and behind them) and a ClangBot (above and between them) as well as several other percussion bots scattered about the space. 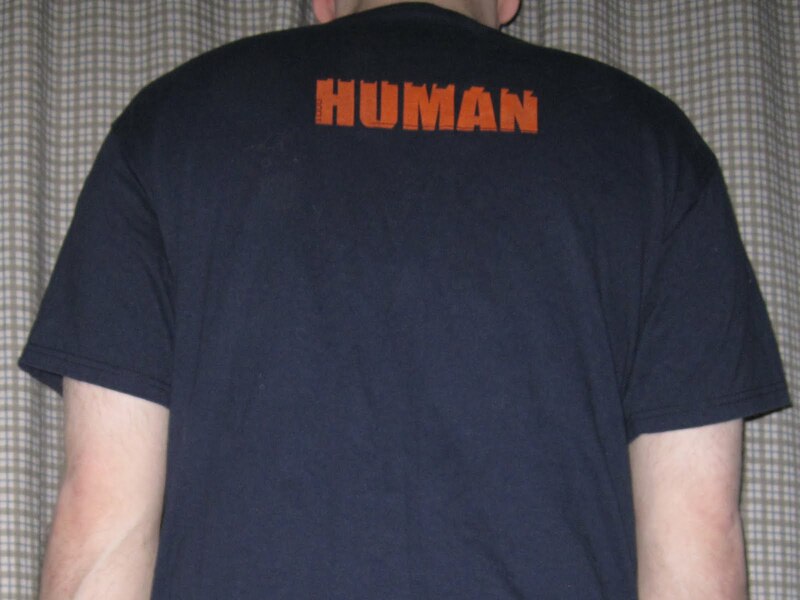 John and John performed three songs as a (human) duo, each of which was rarer then the last. The first song was a shortened yet lovely rendition of With the Dark, one of my favorite songs on The Else. John Flansburgh played a tiple, an instrument that falls somewhere between a ukelele and a guitar. The second song performed was Vestibule, which was never performed live before these LEMUR shows and never since. I'd already felt that this song from Cast Your Pod To the Wind has a kind of mechanical feel to it, which seemingly makes it well suited for the robotic arrangement. The final song performed was an unreleased rarity that was only played once before and never since called Our Cannibal Friends. My camera unfortunately decided that this song was just too rare to capture in its entirety, stopping itself a little bit short of the end of the song. Boy, was I steamed. So sorry! 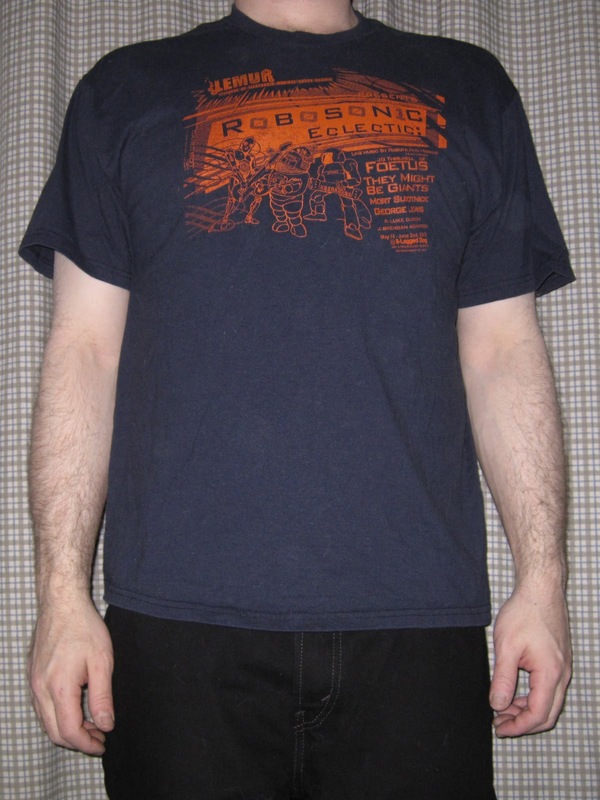 Continuing with the robotic theme, here's the "Adult" version which opened the show on 4/30/01 @ The Bowery Ballroom in New York City. There's an Ant hosting MP3s on this website. Thanks to Ant for hosting all these songs on my Blogspot. But you think that's okay while you're blogging.